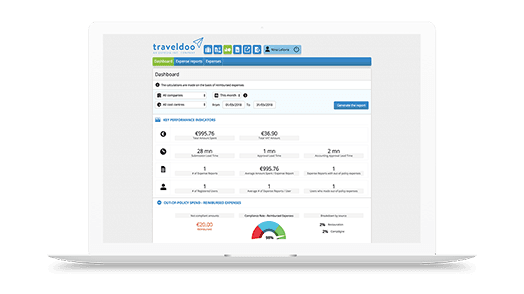 Track and understand the evolution of your travel expenses. Track and understand the evolution of your organization’s expenses. Check your KPIs at glance on your dashboard. 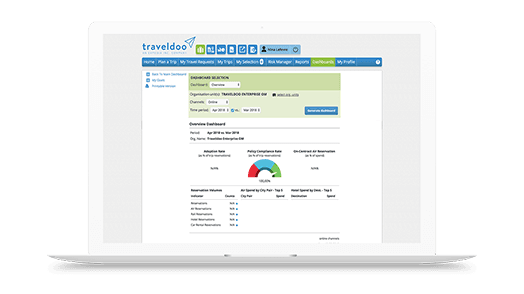 Interactive dashboards help you monitor and control travel spending trends and KPIs such as compliance rate and online adoption rate. They make it easier to understand where objectives are not being met, identify new potential savings, and measure your travel carbon footprint. 50+ drillable report templates covering eight analysis domains – booking activity, compliance, spend, savings, reservation volumes, prices, suppliers and travelers’ spending behavior – you will be able to analyze and track your company’s travel spend over time and across both online and offline booking channels. Detailed reports covering eight analysis domains – activity, spend, compliance, price, suppliers, savings, individual spend behavior and taxes – allow you to analyze precisely and quickly how T&E spending breaks down and evolves over time by expense types, suppliers, cost centers and more. Interactive dashboards help you monitor and control spending trends and KPIs including budget consumption, reporting activity, compliance rates, processing and reimbursement times. With a few clicks you will be able to see where objectives are not being met, identify new potential savings, and fine-tune your policy accordingly. Keep travelers and travel arrangers informed at all times. Improve traveler tracking and provide faster assistance.